The week before the Russian Grand Prix we had a conference call and discussed ideas before heading off on different flights. Crofty came up with the idea of doing a piece on Max Verstappen as race day would be his 21st birthday. "A coming of age piece," he said and we all agreed it was a good idea. I remember the first time I saw Max, as a teenager in the paddock in Belgium before he got into F1. I remember thinking 'he's so young, he can't be old enough to race in F1'. I was showing my age, I realise that, but I wasn't alone and people younger than me also shared that opinion. I love researching these sorts of pieces as I invariably learn things I didn't know about the subject, but I am also reminded of other moments that I had forgotten in the fast-paced F1 world since. Thursday morning was a busy one. First of all Johnny Herbert and I set off early to the Fisht Stadium to take penalties against Carlos Sainz as part of a Renault promotional event. When we arrived we were given strict instructions by the organisers that only four people were allowed on the pitch at any one time. A message that was repeated several times during our short stay there. The problem with that was that we had Johnny, myself, Carlos, a cameraman and a soundman, who is attached to the cameraman via cables, all needing to be on the pitch. Plus we had a Sochi FC player, Nikita, in goal to stop the penalties. So we had to restrict it to Johnny, Carlos one cameraman and Nikita. The other cameraman and soundman stayed behind the goal with me. We recorded a quick introductory link with Johnny, Carlos and I on the pitch and the cameraman off it, but even with just three of us on the grass we got a severe ticking off from one of the Russian security guys. We tried explaining we were only three and the rule was four maximum but he wasn't having any of it. Eventually we managed to finish the filming there and headed to the ice arena to see Artem Markelov, Renault's test and development driver. This time we were all allowed on the ice and Johnny and Artem tried their hand at scoring with Johnny on his back on the ice more than he was on his feet! That done we headed to the amusement park on site at the Sochi Olympic Park. This was to film the last piece of a guide to Sochi and involved riding the three-headed dragon rollercoaster, a mythical creature called Goruinuich. It looked harmless enough but some of the corkscrews high off the ground were stomach churning. Johnny revealed he didn't actually like rollercoasters and when we got off he was really quiet. For someone who has no issue driving at high speeds in one of the most dangerous sports in the world, I found it very confusing. Unfortunately in order to get a second angle of us on the roller coaster we had to ride it a second time. I had been fine after the first run but we both definitely felt a little ropey after the second run! Filming finished we headed to the track and straight into our production meeting for the weekend ahead. After that I headed into the paddock where we filmed giant Jenga with the Haas drivers. We expected it to take 10 minutes or so but we hadn't banked on them being so good at it. Give any driver a competition and they will do their absolute utmost not to lose. There are drivers who refuse to take part in games they don't think they can win at so you have to choose games where there is the real possibility they have played it before and can be confident they can win. Romain and Kevin made it to 31 levels before the tower fell. It took over 20 minutes and their press officers were itching to get them away, but you can't drag a driver away from a competition until it's finished, or you do so at your peril! Then it was down to Red Bull hospitality to film my sit-down interview with Max Verstappen. I started by asking how he would be celebrating his 21st birthday and he said he would be flying back to Monaco on Sunday night and be at home alone. 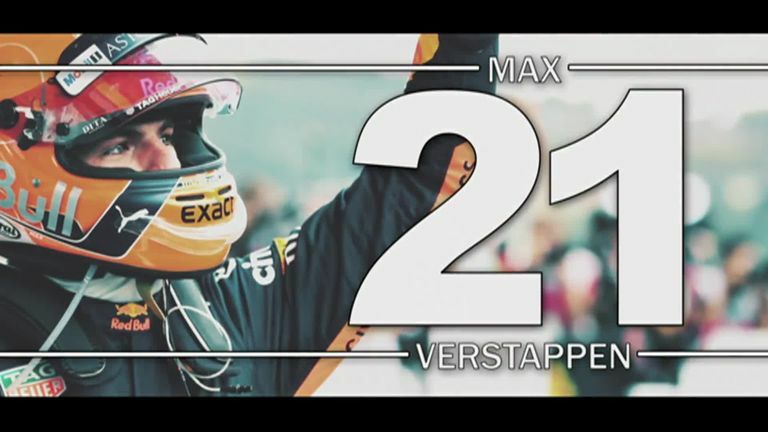 Max Verstappen talks to Rachel Brookes as he turns 21, about his future aspirations in F1. We had a chat about his highs and lows so far and I ended the interview by asking what he hoped to achieve by his next big birthday, his 30th. He said he hoped to have four world titles by then. This was a line that made headlines but the interesting thing was, I don't think anyone who spoke about it said they didn't believe he would. Then it was time for Welcome to the Weekend which is live from the paddock at the end of the day. We had had confirmation of Antonio Giovinazzi at Sauber for 2019 so that was among various topics that evening, as well as Lewis' performance in Singapore, the fall-out from Force India's drivers hitting each other and Red Bull's forthcoming grid penalties. On Friday evening we were invited to dinner by Williams at a Japanese restaurant in one of the hotels in the Olympic Park. It's always nice to get away from the track and talk to people about pretty much anything other than Formula 1, and the food was fantastic. The food and service in Russia has come a long way since the F1 first visited in 2014 and I guess the recent World Cup helped that too. As a result of a conversation over that dinner, Williams invited us to present Welcome to the Weekend in Japan from inside their garage. The F1 Show in Russia featured the two Williams drivers. It was interesting to hear from Lance Stroll what good friends he and Esteban Ocon are despite the situation they find themselves in. It's a shame Esteban can't replace Lance at Williams - but comebacks do happen, as after the F1 Show I went and interviewed Dani Kvyat after it was announced he was returning to Toro Rosso in 2019. That evening we went to dinner at a restaurant down by the beach that I think used to be Bernie Ecclestone's favourite. After the announcement earlier Dani Kvyat was there having dinner with the Red Bull team and the restaurant was littered with F1 folk. Just after we had eaten our main courses, however, the fire alarm went off. The warning was in Russian so we weren't sure if we needed to leave or not and as our table was tucked away upstairs we couldn't see if anyone else was leaving. I got my Google Translate app out on my phone and recorded the audio of the alarm. "Attention fire brigade," came the translation. At that moment the waiter walked in and we asked him what the alarm was about. He shrugged his shoulders and said "It's Russia!" and turned on his heels and walked away. The alarm didn't stop though so we paid our bill and left soon after. On Sunday morning, I arrived at the track and headed as I always do straight to our canteen for a coffee. Inside were three large men in suits with earpieces talking Russian. I knew they weren't part of our crew but as President Putin usually attended the race I guessed they were part of the security operation ahead of his appearance later. Even so, they were very intimidating and a reminder that of however many years we have been coming here, some things don't change. Whether it's the aggressive security at the football stadium or the large numbers of suited men in and around the paddock, there is no mistaking you are in Russia. Before the race on Sunday I was doing my 'toilet run' interviews and caught Sebastian Vettel coming out of his garage. Some days he talks, some he doesn't. This time he gave me a one-word answer to my first question and then ran off. I could have run after him but then my cameraman would have been running backwards in a live pit lane and no driver is worth that, not even Seb. Post-race was difficult. Mercedes used team orders to ensure the win for Lewis and 50-point gap leaving Russia. While I may not be a huge fan of it I understand why they did it and why you can never assume an amount of points is safe until it is mathematically impossible to be beaten. 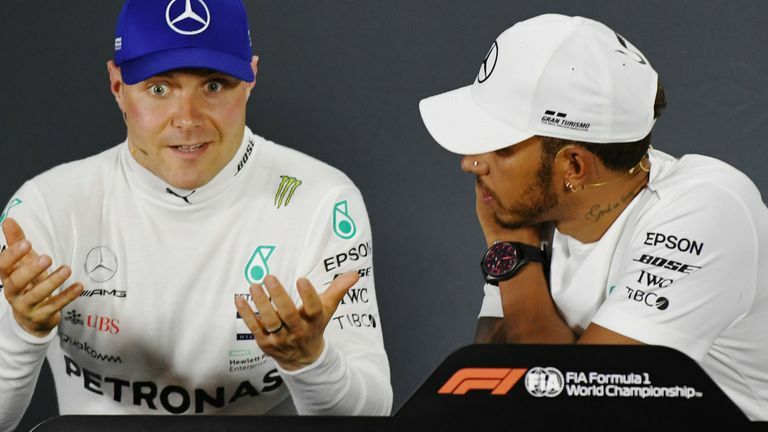 Lewis Hamilton says that having Valtteri Bottas swap positions during the Russian GP was not the way he ever wanted to win a race. It still smarts though. Especially when it is someone as nice as Valtteri, who needed a confidence boost. I remember interviewing him in Singapore post-race and he told me how much he needed to have a good Saturday. He'd done that, taken pole and had the win snatched from his grasp. You could see he was devastated after the race and he said he couldn't wait for next year to start when he would be back on an even footing. He admitted that he wouldn't be able to win a race until Lewis had the title but he understood it. This week I did get to interview Lewis and as my final question I asked him if he asked the team if he could give the place back once they were both free and clear of Vettel and he said he thought about it but didn't ask the team. It's the ruthlessness needed to be a world champion, and a five-time world champion at that. What if he had given that place back and went on to miss out on the title by seven points? Sunday night was a quiet one as I had a 4am alarm call in order to get a flight to Nagoya in Japan. Once in Nagoya, we went to our hotel at the bullet train station and I finally got into bed at 4am local time ready to catch the bullet train the next day to Tokyo. The bullet train is incredible and it runs on time, all the time. It allows about 90 seconds at a station to offload passengers and for new ones to board. When there are six of you with suitcases, bags and camera equipment it's quite an operation to throw everything on board and then try to find places to put it once the doors are closed. It's always entertaining! I got into my hotel room in Tokyo at about 2.30pm that afternoon and am not ashamed to say I had a quick siesta to recharge! That evening we went out to find some food and I had my first experience ever of fried Brussels sprouts. I was craving vegetables after a lot of 'beige food' in Russia and they were pretty much the only ones on the menu, along with purple sweet potato fries which I also ordered. The sprouts were actually delicious and melted in the mouth, I can highly recommend! The purple sweet potato fries weren't quite as good and I won't be trying them again. We then went to an area called Golden Gai, which has to be seen to be believed. It is street after street of tiny bars. And by tiny I mean only big enough for four people at a time. They were like small cupboards made out to be bars. We wandered around until we found one that could take all four of us - in other words one that was completely empty - and sat huddled around the bar observing the hundreds of bank notes stuck to the ceiling and bar from all over the world. I then headed back to research the sites for the next day's filming and write some script, leaving the boys to discover more of Tokyo. Wednesday was a full on day of filming. We had a plan to visit various sites, record links and film and get back to the hotel in time to catch the bullet train back to Nagoya at 6pm followed by a local train to Yokkaichi where we were staying for the race. Japan is an amazing country. The people are so respectful and so smiley. There are notices that ask you not to use your phone out of consideration for fellow passengers, or customers in restaurants. Some restaurants also ask you not to wear strong perfume or cologne so as not to spoil others' enjoyment. Our 90-minute train journeys were blissfully peaceful! One thing I don't enjoy though is the size of the hotel rooms. Even in Tokyo, my room was tiny. I always come back from Japan with stubbed toes, bruised knees and bumps on my elbows. You invariably have no space in your room for your suitcase so it lingers on the floor in the way every time you try to go to the bathroom or close a curtain. We arrived in Yokkaichi at around 9pm and after checking in I had a message that I had an early start as Ferrari had a big announcement to make the next morning at the track first thing. I walked into their hospitality unit and the rumours were already rife that it was a new livery. As it turned out the rumours were true for once and they revealed an MW logo would now appear on the car as would the words 'mission winnow'. They also let us know in their press release that 'to winnow' is to separate the wheat from the chaff. I am not sure it conforms to the rules though, but then neither does Kimi! Our Welcome to the Weekend show in Japan was great fun. I got to sit in Sergey Sirotkin's car at the start. I was actually worried I wouldn't fit but it was surprisingly roomy inside. You have much more room for your elbows than I thought you would and the biggest surprise was how little you notice the halo. It's like holding your finger out in front of you at the end of your nose, it is hardly noticeable at all. For the rest of the show we were in the garage trying to keep out of the way of the mechanics still working into the evening. One thing the teams do all enjoy in Japan is the visits of local schoolchildren on Thursdays. They fill the pit lane and some sing and dance and give gifts to the men and women who work in the garages and rarely get the limelight. It's fantastic to watch and you can't help but be lifted by it. When you arrive into the paddock each day there is a red carpet down for the drivers to walk on. Alongside is a fenced-off line where the fans patiently and politely wait for their favourite drivers. Johnny and I walked the line on Saturday during our qualifying build up to show what it was like and while we there one fan produced a box of cars. Not just any cars, there was almost every car Johnny drove as well as some replica helmets! Their devotion is incredible and is usually rewarded by a lot of signatures from all the drivers who pass. The Renault boys joined us for The F1 Show after what was another difficult qualifying session. Their season seems to have stalked while others around them are improving so I wasn't sure what mood they would be in. But the good thing about Nico Hulkenberg and Carlos Sainz is that they bounce off each other so well we needn't have worried. They said they have just built up a nice friendship and now they are being separated again. Carlos' 2019 team-mate at McLaren, Lando Norris, featured in our giant Jenga game this week against Stoffel Vandoorne and again it went to 31 levels. They were both determined to beat the Haas boys but I think we may have found the limits. Lando was holding the tower up with one hand by the hand as it lent over perilously but he somehow managed to shift it back enough to be able to let go. It wasn't entirely legal and Stoffel simply stepped forward to blow on the tower gently and it toppled meaning Stoffel was officially the winner. Fernando Alonso walked past twice during the game and even tried to get involved, you can't keep a driver away from a competition, of any sort! It was a baking hot day for race day. I managed to speak to a few of the drivers on their way to their classic cars for the track parade. After a disappointing Saturday, Daniel Ricciardo told me he'd been watching UFC to get him in the mood for the race. I'm always fascinated by how drivers prepare, and always amazed they talk so much to us in the moments leading up to the race. The title seems to be now a case of when rather than if Lewis Hamilton wins it. It's a shame Ferrari's challenge has petered out so rapidly. I really wanted the fight to go to the end of the season as I always feel that's when you see drivers at their best. That said, Lewis has been on another level since the summer break as he often is. Add to that what seem to be improvements in the car and the team's understanding of the car, and you have an unbeatable combination. Sebastian's body language was that of a beaten man after the race in Japan, another occasion where mistakes on Saturday cost them on Sunday. 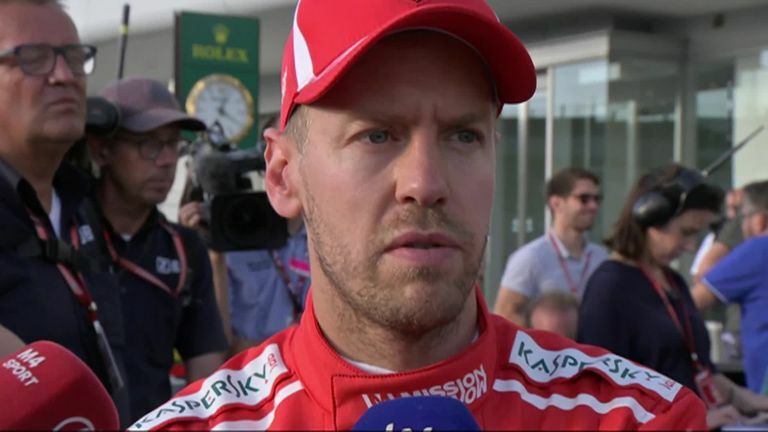 Seb is really good at saying the right things and not apportioning blame to others but I wonder what he is thinking right now? Sebastian Vettel discusses his move on Max Verstappen, and the disappointing weekend at the Japanese GP. Lewis didn't do the pen again in Japan so that he could join our presentation team so I don't know how he felt after the race but he now heads to one of his favourite venues of the year where he could clinch his fifth world title and draw level with Juan Manuel Fangio. I imagine he feels pretty good right now. When's the US GP on Sky F1?